I'm loving the new(ish) Moisture Tint by Mac. I'm using the medium/dark and it's the perfect shade for me (I'm NC40). It feels moisturising, but doesn't leave you oily at all. It's actually a lot like a lightweight foundation, which is great for summer. It covers just enough redness and is natural looking. For $48 AUD, I think it's worth it. I will be using this a lot in the coming months as it's getting hotter and I don't want to wear foundation. The only problem with this is that if you don't use enough it can get dry quickly and really tug at your skin. I pair this with the Studio Fix powder by Mac (C5) and I swear, it's a match made in heaven. With concealer in the right spots, I look like I have flawless skin and the best bit is that it's so lightweight and natural looking! This will be my foundation routine for summer. Who wants to cake their face only to have it melt off? I've worn the Moisture Tint, Studio Finish concealer and Studio Fix powder and it's lasted all day. I don't get oily at all. Usually I have to blot throughout the day, but I didn't have to do it at all with the Moisture Tint! So all in all, a great product. I think I have found my holy grail. This has replaced the need for foundation. I wear it even for nights out, it's that good. I feel so comfortable with it on my skin and love the way it looks. 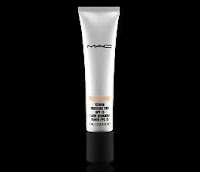 Five stars for the Mac Studio Moisture Tint! 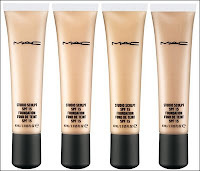 I've been needing a decent foundation for a long time and I finally went out and got myself the Mac Studio Sculpt foundation. I've heard great things about the Mac Studio Fix Fluid but I didn't want something matte, I wanted a glow to my skin so I decided on the Sculpt. I'm not sure how much it cost because I also bought some brush cleanser, concealer and powder. All together is was about $155 (AUD). So far I've only tried it with one brush, the Mac 109. I want to try it with a 190 next, but I don't have that brush. But anyway. The foundation went on fine and it wasn't hard to blend, it gave me a medium coverage and actually looked really natural, like real skin. It wasn't overly shiny, it gave me a nice dewy natural look. Kinda like I had a natural glow about me. I used Mac Studio Fix powder over it which looked ok, but I think it made me look too made up. So I want to try the Mineralize Skinfinish Natural next. 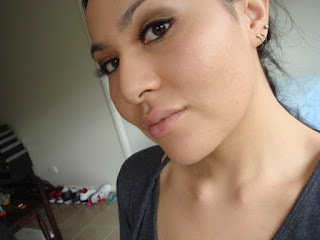 I really like the Stuid Sculpt, it is a lot better than the Revlon that I was using. I wouldn't wear it for everyday, though. Just special occasions. I might wear just the Studio Fix powder as a daily go to look. So all in all, I'm very happy with my purchase and I would recommend the Studio Sculpt for anyone who wants a natural, dewy look. Oh btw, excuse my hair in this photo, it was a spur of the moment shot and I didn't think to fix my hair. Yes I walk around with frazzled looking mum hair because that's what I am, a frazzled mum! In the photo I'm wearing Mac Studio Sculpt, Mac Studio Fix powder, Dior blush/illuminiser and YSL eyeshadow, as well as false lashes. Nothing on my lips!